The 30-06 Springfield cartridge is equally at home shooting deer at long distance as it was shooting from house-to-house in Nazi-occupied Europe. As far as all-around rifle cartridges, the 30-06 is one of your best choices due to its ability to shoot varmint-weight bullets all the way to 220gr enhanced-penetration bullets. With a kinetic energy of 2900 ft-lbf, the 30-06 Springfield is capable of hunting Elk at moderate distances and is more than capable of incapacitating smaller targets at closer ranges. 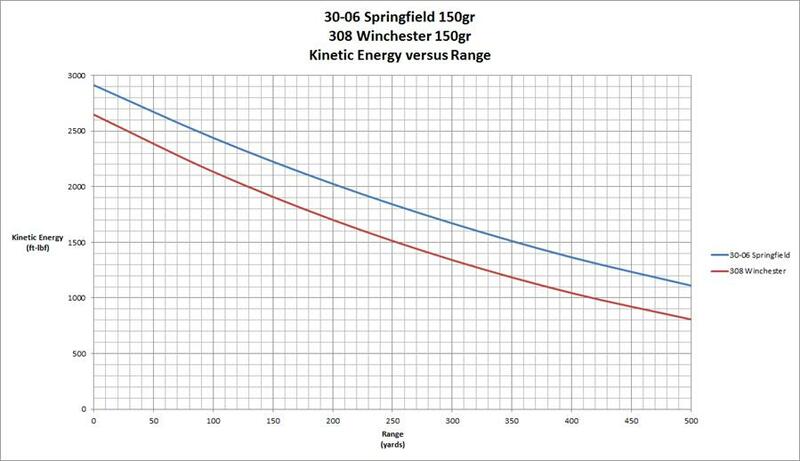 Let us take a look now at the 30-06 shooting 150gr projectiles and compare it to the 308 Winchester shooting 150gr projectiles (see Figure 1). So why shoot a 30-06 Springfield when 308 Winchester rifles are more plentiful? There is no reason not to shoot a 30-06 Springfield rifle if you are able to tolerate the extra recoil. On a lightweight hunting rifle, the difference between the two cartridges should be dramatic enough to warrant consideration. Heavier rifles don’t have this drawback and work to reduce the difference in recoil to a trivial amount. For a frame of reference, a 308 Winchester at 500 yards has the same kinetic energy as does a 44 Magnum at the muzzle. The 30-06 Springfield referenced above has the same kinetic energy at 500 yards as does a 223 Remington at the muzzle. If you can hit the target at 500 yards, you can be sure that the 30-06 is enough for deer hunting and personal defense. Owning a rifle chambered for 30-06 Springfield gives you the unique opportunity to make use of the M2AP armor piercing ammunition. While the majority of these rounds, as military surplus, were undoubtedly wasted shooting beer cans, the remaining cartridges offer exceptional ability to defeat hard armor and are legal for private citizens in many locals to possess. 30-06 Springfield rifles can easily shoot 220gr bullets if long-range velocity retention is your preference. I recommend owning nothing but soft point ammunition for this cartridge and also the M2AP if you are legally able to obtain some. Military surplus ball ammunition is ok … but just make sure that you get a good deal on it.